AuSable Valley Audubon is pleased to be chosen to participate in the Giving Tuesday program for our third year. Each year more members and non-members have donated and the total raised has increased. The AVA board has set a goal of 50 donors and a total of $1,500 for 2018. Please invite your friends and neighbors to join us. 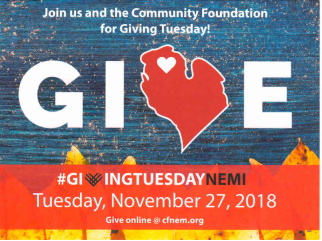 On Tuesday, November 27 go to www.cfnem.org/givingtuesday and click on the AuSable Valley Audubon logo among the 60 participating non-profits to make a credit card donation to AVA. Here is a last minute interview of Susan Duncan with Kevin Allen from WKJC Radio. Covering the Christmas Bird Count, the December 11 meeting and also covering Giving Tuesday.